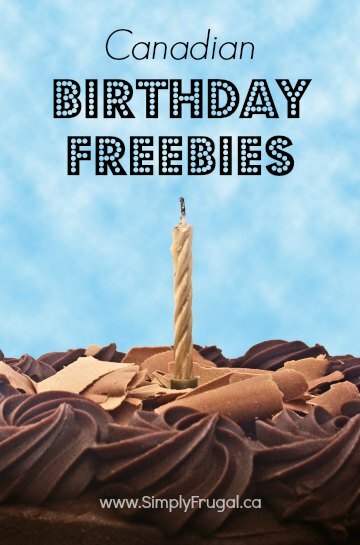 In honour of all the birthday’s we celebrate, I thought this roundup of Canadian birthday freebies would be great so you can sign up in time for your birthday! Enjoy! Timothy’s Coffee – Free baked treat with any medium coffee purchase. Milestones – Free entree when you purchase 3 other entrees. Must show ID. Booster Juice – Free regular smoothie on your birthday. I’m sure there are many other birthday offers out there in Canada, so if you know of any, let me know! Carlos O’Bryans in Vancouver deducts the age you turn from the bill. If you turn 50, they take off $50 off your bill. My husband takes me out. They have excellent food. Pita Pit More Rewards gives you 400 points on your birthday. That is enough to get a free small smoothie or a free petita. You have a month to use the points. Great Canadian Bagel gives you 6 free bagels during your birthday month. Sign up in advance and they mail you a postcard with the promo. Pizza Delight offers a free meal when accompanied by another customer. For those of you in the lower mainland…there is a restaurant in White rock called WAG |(washingtom Avenue Grill) and you get an entree up to $25 free on your birthday. Get on their list…they will mail you a certificate and you have to bring it in with you! Very nice place…in the summer you can sit outside and overlook the ocean! Hi, I also know that on your birthday you can head to Humpty’s (with Photo ID) and either get a free pancake breakfast or a chocolate cupcake (I guess if you’re having dinner). I highly suggest it, the Humpty’s here in Winnipeg is on the outskirts, but I have never been disappointed yet, my partner and I will definitely be enjoying this on our birthdays. I’m sure to look into some of these other freebies too. It makes for a sweet month as both our birthday’s are in February. Medievel Times gives you a free dinner ($63.00 value) with the purchase of a regular price dinner during the month of your birthday when you sign up online. ID is required to redeem at the restaurant. The only Medievel Times is in Toronto. My b-day is this sunday and I want to thank you for posting these freebies, I went to Joey’s last night for my free dinner which I was very pleased they have the best fish & chips I’ve ever had. They only allow up to 25 dollars max off your bill, they basically just deducted my meal and drink. My next free meal is Tony Roma’s, thanks again for your hard work I love your site!!! Happy Birthday! Kelly O’Brien’s also offers a free birthday dinner (up to $19.99 or that much discounted off your entree if it is more).